One on my favorite posts from Hyperbole and a Half is this one. In the beginning she decides to fix her whole life by acting like a responsible adult, being organized, etc. maybe, as my husband says, my desire to organize my environment is due to lack of organization and peace inside my head–although everything he says is suspect, as he is not above playing to my quasi-Buddhist leanings and innate feelings of inadequacy so that I’ll go meditate and stop asking him to help with household chores. 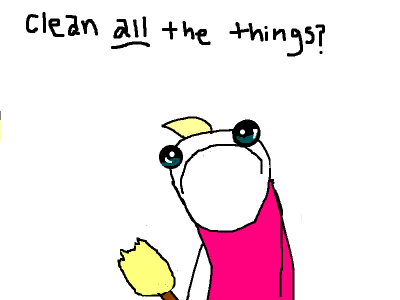 Regardless of the reasons, for the last few weeks every time I look at a shelf or a drawer, I want to clean and organize. When I pass my keyboard, I want to sell it (Korg SP-100 with 88 weighted keys, natural piano sound, plus some others–let me know if you’re interested and local) because I don’t play it anymore. I want to move everything from the hall closet into the garage, and when I see the garage I want to blow it up. But there is this–I think I might look back at the end of my life and say, “I wish I’d spent less time looking for keys or my right shoe or and driving back home for missing documents, and arguing with living companions and feeling suffocated by living with what is essentially debris.” So maybe, in a way, I will wish I had spent more time cleaning–with cleaning being the stand in word for a lot of other things. “Housekeeping” at big meetings, is what they call all the little logistical details that need to be covered in order for things to run smoothly. 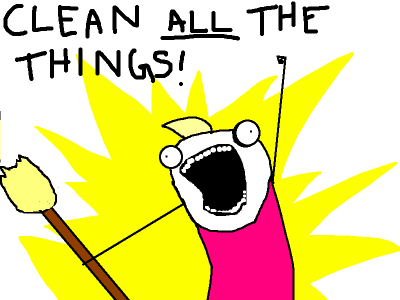 So 2012 may be the year of housekeeping–and all the things that implies, or that I decide it implies as the year goes on. Updates to follow (unless that starts to seem too hard). *I have no idea if Erma Bombeck ever said that. Previous Previous post: Happy New 2012!